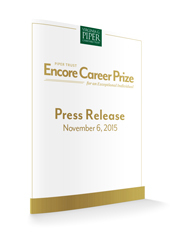 1. Who is eligible to apply or be nominated for the Piper Trust Encore Career Prize? not involved in a project that is exclusively religious or sectarian; people working in faith-based settings that have a broader social mission are eligible and are encouraged to apply. 2. Who is an ideal candidate for the Piper Trust Encore Career Prize? is creating lasting impact and improving a social cause. 3. Can the candidate be a volunteer? Piper Trust recognizes the great value volunteers offer in their after work hours and applauds organizations and businesses that encourage their employees to volunteer. What Piper Trust seeks to honor in the Encore Prize for an Exceptional Individual, however, is someone, age 50+, who has created a program or embarked on a new career leading a focused effort addressing a major social need in the community. If the candidate created and is leading a social purpose endeavor, he/she can be leading the effort in a volunteer/non-paid capacity, receiving a stipend, or paid a salary as long as the candidate is leading a social purpose effort that is not within a for-profit operation. 4. Can the candidate be an organization? No, the Piper Trust Encore Prize for an Exceptional Individual recognizes individuals. 5. Can more than one nomination be submitted for a candidate? No. Candidates can only be nominated once each year; only one nomination is accepted for a candidate. Multiple nominations for a candidate do not increase chances for selection. If you know someone who is nominating the same candidate, the best approach is for nominators to work in collaboration to nominate the candidate and submit one application. 6. 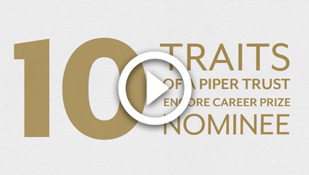 What factors would make someone INELIGIBLE for the Piper Trust Encore Career Prize? Note: Applicants selected for consideration as finalists must disclose any current or prior financial relationship or other support they have received from Virginia G. Piper Charitable Trust and/or members of the selection committee. Other support includes, but is not limited to, technical assistance, promotion, and advocacy. A current or prior relationship, financial or other, does not immediately disqualify an applicant, but such factors will be considered in finalizing a diverse pool of applicants. Similarly, the Piper Trust Encore Career Prize selection committee members, staff of Virginia G. Piper Charitable Trust, and members of Virginia G. Piper Charitable Trust’s Board of Trustees are required to disclose any current or prior relationship to any Piper Trust Encore Career Prize candidates. Virginia G. Piper Charitable Trust reserves the right to disqualify any applicant at any time and for any reason should the Trust determine misrepresentation of a candidate’s qualifications and/or social purpose work. 7. How will nominations/applications be evaluated? Does the nominee exemplify a compelling model for an encore career? Does the nominee’s work combine personal meaning and social impact? Is a significant social problem being addressed? Does the social purpose work demonstrate innovation? Does the work generate social value in a broad way (through size, scale, reach, collaborations)? Does the nominee demonstrate resourcefulness to achieve his/her purpose (forming alliances, partnerships, gathering resources)? Does the social purpose work demonstrate tangible, meaningful impact? Is the impact of the social purpose work being tracked, measured, or evaluated effectively? 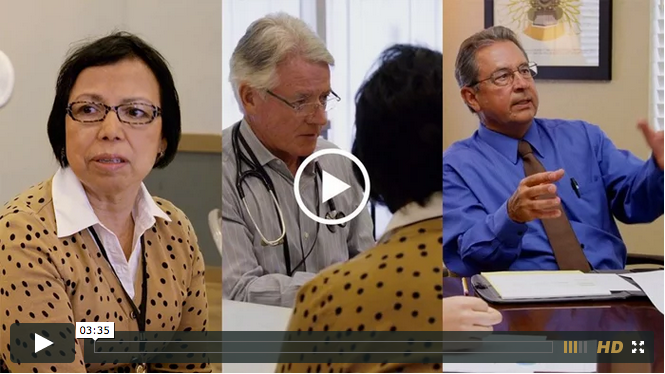 Are there demonstrated results in terms of economic, social, or environmental outcomes? Does the nominee plan to expand his/her work to a broader scale in the next three to five years? Does the nominee identify or propose continued innovation in his/her work? Will the nominee be personally involved in the future work? Is there a plan to continue this work beyond the nominee’s involvement? Does the work demonstrate effective financial practices and/or a meaningful financial commitment or sacrifice by the nominee? 8. What is social purpose work? As it relates to the Piper Trust Encore Career Prize, social purpose work combines the experience of a person, age 50+, with a social cause that he/she is passionate about—a meaningful issue that someone applies years of talent and expertise to, and through this work a significant difference in the quality of life for others is achieved. 9. Is the social purpose work required to be within a new organization and/or a 501 (c) (3) started by the candidate? No. The social purpose work or endeavor can be in the form of an organized project and does not have to be within the structure of an organization or a 501(c) (3). However, simply applying strong management skills to improve the performance of an organization is not sufficient. 10. How recent does the social work need to be? The Piper Trust Encore Career Prize is not a lifetime achievement award. The candidate’s social purpose work must have started at age 50 or older and demonstrate innovation, creativity, and effectiveness with a track record of impact for a minimum of three years. A strong candidate is an encore role model that showcases new kinds of socially significant work, built on years of experience. 11. What if the candidate is involved in more than one social purpose endeavor/organization? Although the application only allows one social purpose endeavor/organization to be entered for a candidate, the application questions will allow space to share other related accomplishments of the nominee. 12. Must the nomination be in English? Are hard copy applications accepted? Yes, applications must be written in English and submitted through the online application form. Hard copy applications or attachments will not be accepted. 13. If nominating a candidate, what is needed to start and complete a nomination? We encourage nominators to thoroughly review the application in advance (located at www.pipertrust.org/encore/individual-overview/nominate — Apply) so the required information about the candidate and his/her social purpose work can be compiled effectively. Three reference letters and a resume for the candidate must be submitted with the application. Nominators will also need to know what the candidate was doing prior to the social purpose project for which he/she is being nominated. Please note that an application does not have to be completed in one sitting; an incomplete application can be saved and returned to at a later time. To do so, click “Save My Progress and Resume Later” located on the top and bottom of the application before closing your web browser. You will be asked for your email and to create a password so that you can access the application at a later time. An email confirmation will be sent that includes a link to the incomplete application. 14. Do all questions have to be answered? Yes. Incomplete nominations will not be reviewed. 15. Who can submit nominations? Nominations are welcome from any individual with knowledge of a potential candidate. Note: Tax law requires an awardee to report the award as income on his/her tax return unless he/she was not substantively involved in the nomination; if the awardee was not substantively involved he/she can designate the award be given to a 501(c)(3) organization. 16. Are there eligibility requirements for nominators? Nominators should be well acquainted with their candidate’s qualifications and be available for possible follow-up questions throughout the selection process. 17. Is a nominator required to inform his/her candidate of the nomination? Yes, as it is important for a nominator to be very familiar with his/her candidate’s work to put forth a strong, well-informed nomination. Tax law requires an awarded individual to report the Prize funds as income on his/her individual income tax return if the awarded individual plays a significant role in preparing his/her nomination. A nominator, who believes his/her nominee may wish to have the option of designating the Prize to a nonprofit organization, and avoid any tax liability, should not directly involve the nominee in preparing the application. 18. Is it possible to print a completed application? Once an application is submitted, a page will display asking the submitter to confirm the submission; on this page the submitter will have options to review, print, and officially confirm/submit the application. The submitter MUST click “confirm” before the application is officially submitted. The submitter will then receive an email confirming receipt of the application. 19. Who makes the final selection of the Piper Trust Encore Career Prize awardee? A selection committee of local and national members will review the applications and recommend who should be selected as the Piper Trust Encore Career Prize awardee. The selection committee members’ awardee recommendation is subject to the review and final approval by Virginia G. Piper Charitable Trust Board of Trustees. 20. What is the timetable for nominations and selection of the Piper Trust Encore Career Prize awardee? Nominations are due in mid-June and finalists will be contacted in July/August and asked for additional material and possible interviews. The selected awardee will be notified by September 2017 and receive recognition as the Piper Trust Encore Career Prize awardee at a special event in October/November 2017. 21. What additional material and/or steps will be required if a candidate is selected as a finalist? Note: Piper Trust will conduct criminal and background checks on finalists in addition to possibly contacting references. Misrepresentation of qualifications by any candidate will disqualify him/ her for further consideration. 22. Once submitted, is there confirmation that a nomination/application has been received? An email acknowledgment is sent upon submission of the online nomination/application; if you do not receive an email confirmation, please check your SPAM inbox. Once submitted a nomination/application may not be changed. 23. What is the monetary award and how can it be used? The monetary award is $50,000. The awardee is not required to render substantial future services. There are no restrictions on how the Prize money may be used, but Piper Trust’s expectation is that the funds are directed to contributions that benefit the greater social good. 24. Is the monetary award taxable income for the Piper Trust Encore Career Prize awardee? If the awardee keeps the monetary award, it will be taxable income. If the awardee was nominated by a another person and did not participate in the nomination, he/she may designate that the award be given directly to a 501(c)(3) organization, in which case his/her tax liability will not be affected. 25. 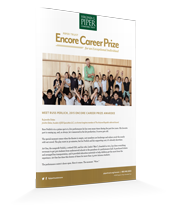 How often is the Piper Trust Encore Career Prize awarded? Virginia G. Piper Charitable Trust plans to award one $50,000 Piper Trust Encore Career Prize every other year; the inaugural Encore Career Prize was awarded in 2013. 26. Are there types of innovation that cannot be considered for the Piper Trust Encore Career Prize? Creative endeavors that do not include work to spread their impact throughout society will not be considered. For example: We are unable to evaluate scientific or technological inventions on their own merit. An inventor would need to describe how he/she has spread the use of an invention resulting in a measurable social impact. Similarly, an academic researcher or artist would need to demonstrate that he/she has also been involved in taking research or art and using it to address a significant social problem with demonstrated effects. 27. Who is the contact for further questions?